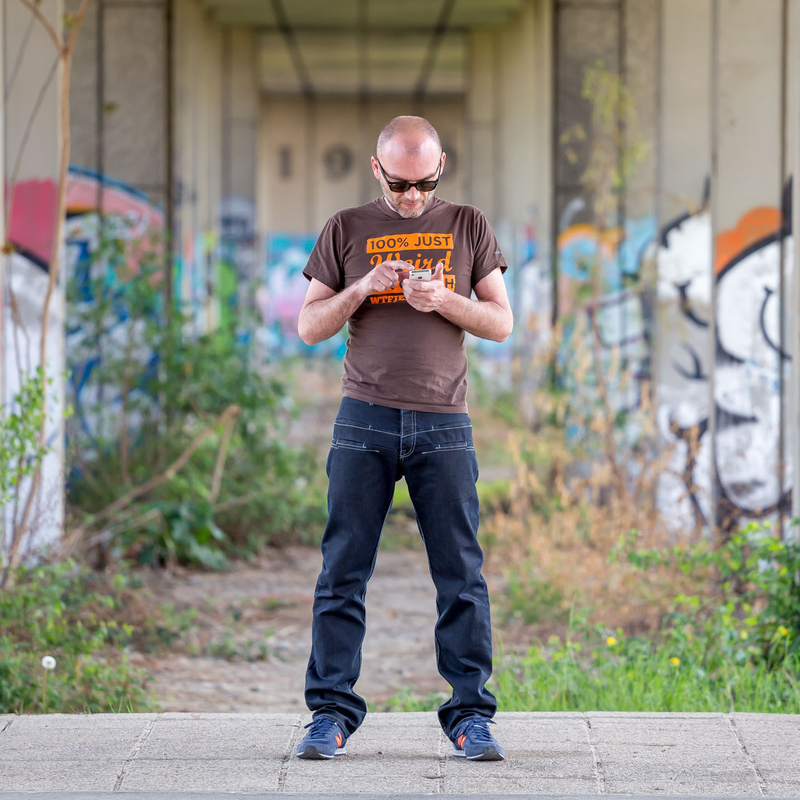 In late 2013, a team of scientists partnered with Croatian jeans manufacturer WTFJeans, and have now just released a new model of smartphone-optimized jeans dubbed "The V3"... with internal EMF-radiation shields, a nanotechnology based liquid & stain repellant treatment, and a smartphone pocket integrated into the front of each leg, made of a microfiber cloth that automatically polishes smartphone surfaces. The EMF-radiation shield is made from a very thin, copper-based fabric that is 99.999% efficient in reflecting the EMF radiation from cellular phones. This fabric has been sealed in a plastic pouch, which is inserted into a special pocket from the inner side of the jeans. Because it only reflects the radiation coming from one side of the phone (the side facing the wearer's body), normal smartphone operation is not noticeably affected. 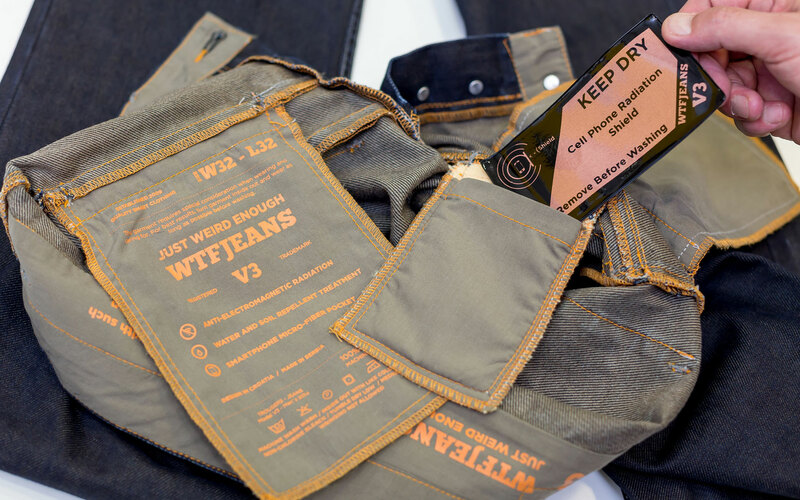 An amazing nanotechnology based treatment is applied throughout the denim and repels almost any liquid, including oil, so that even a bike ride in light Seattle rain, and a messy cheeseburger lunch will still allow for it's wearer to remain clean and dry. The smartphone pocket, dubbed the "WTFPocket", is optimally sized for the iPhone 5 series of phones, and will also accomodate similarly sized smartphones. These pockets make use of a microfiber cloth lining that cleans fingerprints and smudges as the phone is inserted and extracted... and, because of the rubbing action between the cloth and screen during daily activities, the screen is cleaned thorughout the day. Most importantly though, it allows for instant and easy access to your smartphone while sitting at a computer or driving. Pockets for the wearer's hands have also been added in this model, along with smaller refinements like concave shaped top buttons, bright orange interior print and stitching, and other esthetic design enhancements. The V3 has been launched this week, and is available immediately for 177 US Dollars, plus shipping, in men's dark, regular fit, exclusively at http://wtfjeans.com. Custom sizes and personalized printing of a name or message inside are optionally available for an additional cost.